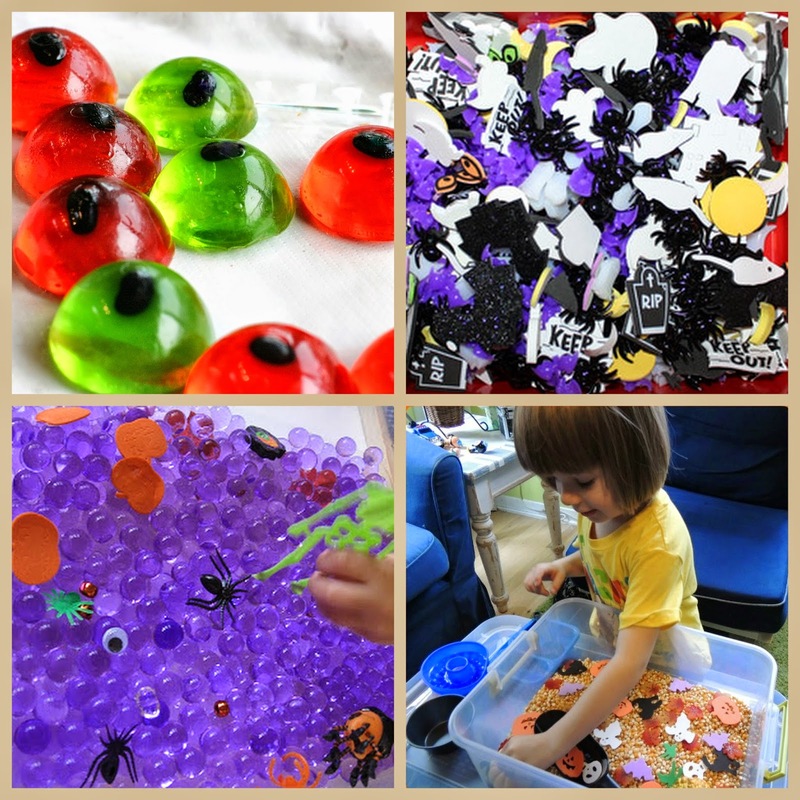 Discover the nature and practice fine motor skills with spooky (or not so spooky - cute!) Halloween sensory bins. They promote creativity and engage in pretend play, encourage independent and cooperative play while Mommy is busy in the kitchen. We found the most inspiring and festive ideas for fall fun. How not to love all things sensory play? Check out beautiful Fall Sensory Bins and activities found here: http://www.mybrightfirefly.com/2014/09/30-creative-fall-sensory-bins.html. Love. Play. Learn. 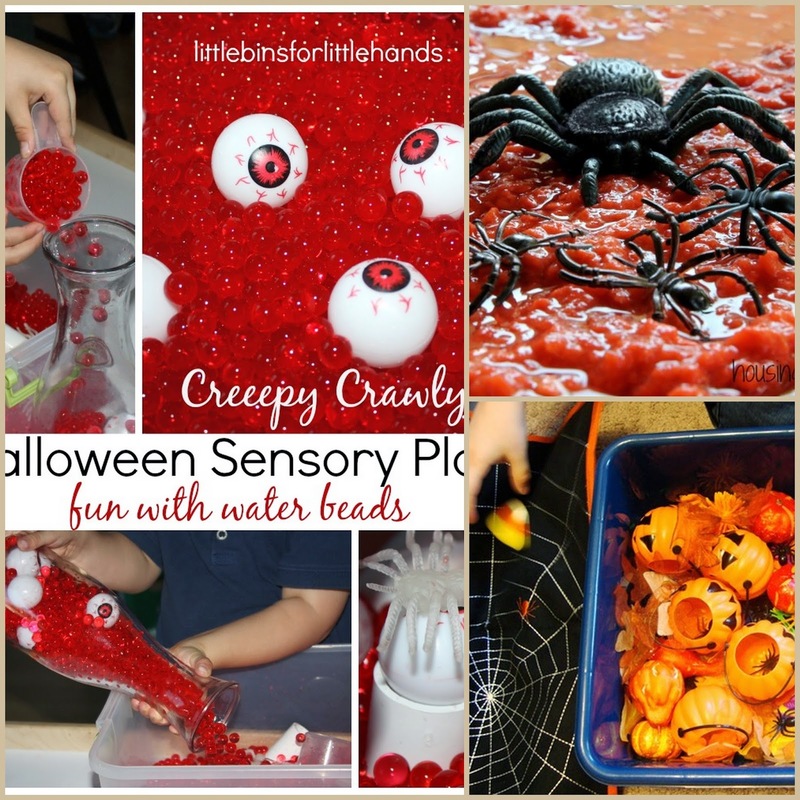 set up a super fun Halloween sensory bin. 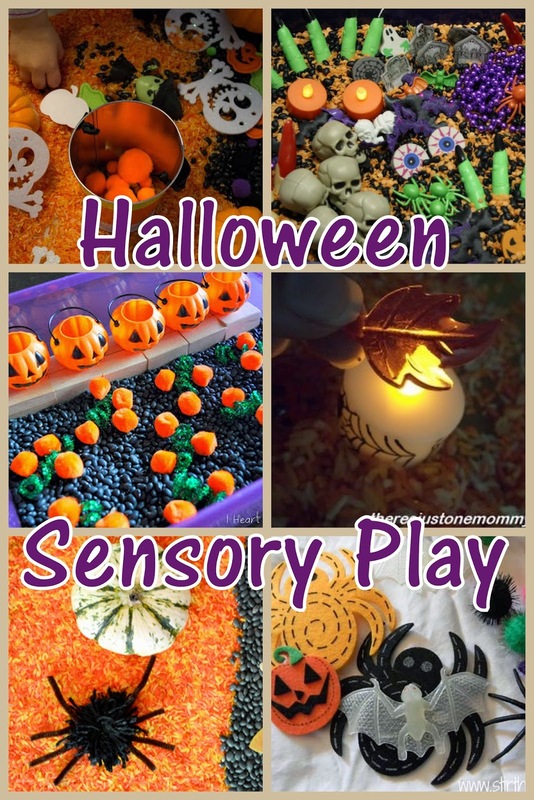 Happy Hooligans have lots of tips for Halloween sensory bins creating and playing. Five Little Pumpkins can be found in the black beans over at I Heart Crafty Things. You can also check out their Pumpkin Guts sensory play. There's Just One Mommy made a spooky sensory bin for her daughter's birthday party. Adventure in a Box created a little spider made from yarn and pipe cleaners. Fluffy and cute creature he is! Rubber Boots and Elf Shoes feature a Halloween Bin in White: the contrast of black and white colors is very engaging for the little ones. Stir the Wonder used Jack-O-Lantern as a bin for all thing Halloween fun for toddlers. Lots of fun fine motor and sensory play with gelatin eye balls was spotted over at Fun at Home with Kids. Pretty purple water beads are beautiful in a sensory bin from Sugar Aunts. 3 Dinosaurs had fun playing with foam sticker and table scatters in their sensory bin! Glittering Muffins were busy making pumpkin pies and counting hidden leaves in their sensory bin. Royal Baloo used the monster puppets as bags in their fun Halloween sensory bin. Housing a Forest had a blast playing with their goop filled bin. These might look appealing for kids and adults at your party!